Limited stock on sizes S & M so be quick! 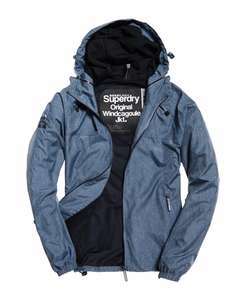 Personally don't buy superdry stuff as it's just not big enough, the XXL was a large L/small XL in this style of jacket, seem to think the grey version was this price later on last year? wouldnt buy from the eBay store as they took 5 weeks to sort out the 1 I returned that didn't fit? Bargain. Sizing as always clearly listed on Superdry description. Have ordered many such items and all fit well. Bargain. Sizing as always clearly listed on Superdry description. Have …Bargain. 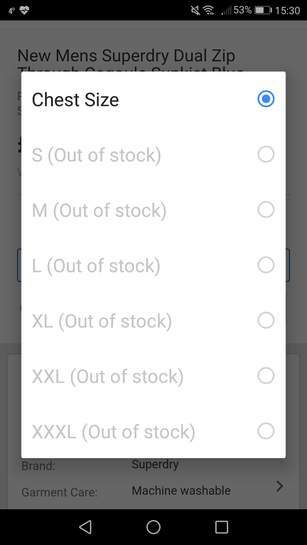 Sizing as always clearly listed on Superdry description. Have ordered many such items and all fit well. Yes. I went a size up in my first superdry order and i was wrong after that i stay true to my normal size. Perfect. I even went to superdry store in croydon to check my size. Medium is perfect for me. Yes. I went a size up in my first superdry order and i was wrong after …Yes. I went a size up in my first superdry order and i was wrong after that i stay true to my normal size. Perfect. I even went to superdry store in croydon to check my size. Medium is perfect for me. Seems to be different for alot of people.. some go up some dont.. maybe its just the way people like it to fit.. i like them snug so my size is usually right in superdry coats.. i dont get why so many people dislike these (chav etc) i think they look hot on guys! Personally don't buy superdry stuff as it's just not big enough, the XXL …Personally don't buy superdry stuff as it's just not big enough, the XXL was a large L/small XL in this style of jacket, seem to think the grey version was this price later on last year?wouldnt buy from the eBay store as they took 5 weeks to sort out the 1 I returned that didn't fit? All gone! Put in my basket and it had gone! 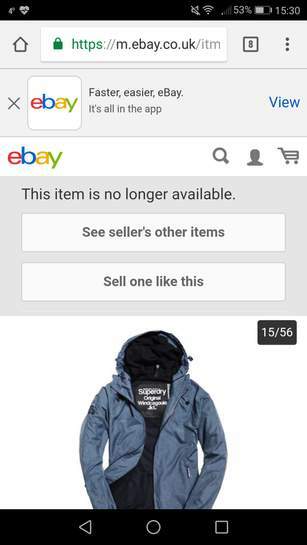 Just went to take a look as they look pretty nice and to my surprise was greeted with "This item is no longer available". This had literally arrived on WhatsApp 8 minutes ago. althoigh M&S clothes tend to be "older" in style and not cheap, I find XXL in some of their stuff (outerwear) almost too big? Mountain warehouse XXL has been pretty spot on for a comfortable fit in coats/jackets? my experience with the Superdry Ebay store was woeful, enough to stop me buying from them again, have purchased from them without problem previously for the missus/children, but returning an item that just didn't fit was a very prolonged and arduous process, involving eBay's resolution centre who weren't talking to eBay or Superdry, it went on and on and on. got sorted in the end, eventually! Its all relative really, I'm 6'5" and of a larger build so some brands are …Its all relative really, I'm 6'5" and of a larger build so some brands are never gonna fit althoigh M&S clothes tend to be "older" in style and not cheap, I find XXL in some of their stuff (outerwear) almost too big?Mountain warehouse XXL has been pretty spot on for a comfortable fit in coats/jackets?like Superdry as a brand, they just don't make anything big enough, not even for a snug fit, not for me at least my experience with the Superdry Ebay store was woeful, enough to stop me buying from them again, have purchased from them without problem previously for the missus/children, but returning an item that just didn't fit was a very prolonged and arduous process, involving eBay's resolution centre who weren't talking to eBay or Superdry, it went on and on and on.got sorted in the end, eventually!